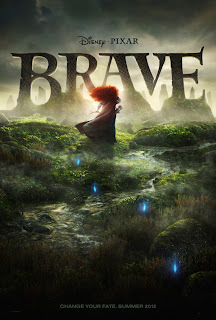 Ingredients: If you liked the girl power of Disney’s Mulan, role play of Freaky Friday, and the typically awesome animation of virtually every Pixar movie ever, then you’ll like Brave. Merida, voiced by Kelly McDonald, is not your typical Disney princess. She isn’t waiting around for a Prince Charming to kiss her and wake her up or help her find designer footwear. No she’s much more independent and free thinking, as hard to tame as her wild red locks. But it’s not a man who’s trying to tame this head strong lass, no, it’s her mother, Queen Elinor, expertly voiced by Emma Thompson. As in most teenage relationships in real life, the struggle for independence and autonomy is sometimes, grizzly…get it? You will if you see the movie. Merida’s mother just doesn’t understand her and Elinor’s daughter doesn’t understand her either. The struggle between these two head strong women makes up the plot of the story, an excellent Mother’s Day film. Maybe Pixar released it about a month too late. There’s a lot to like about this film, but the trailer is deceptive. Merida is as tomboyish and brave as Mulan, but the real star of the show is Emma Thompson’s character, Elinor. Elinor is the mother for all mothers. She has four stubborn children: Merida and her three mischievous brothers who steal virtually every scene they are in as well as every dessert in the kingdom. Perhaps Mark Andrews and Steve Purcell, the scriptwriters, are Sarah Palin fans based on their 'Mama Grizzly' approach to Elinor’s character. Regardless, it works. Elinor can manage all those kids and her barrel of a husband, Fergus (Billy Connolly) and keep the peace when things go wrong. She may have trouble initially catching fish, but there’s not a lot she doesn’t handle with grace and style, even in a fur suit. The movie is enjoyable and, like a good Disney movie, a little tear jerking. If The Lion King is the movie for father-son bonding then Brave is the one for mother-daughter. It has the fun Pixar adult humor we’ve come to expect hidden within child appropriate animation and characters. Hope you enjoy it as much as I did.